The Trump administration's decision to withdraw was seen as a step back. In the year since president Donald Trump announced that he intends to remove the U.S. from the Paris Climate Agreement – a move which was panned by some American allies – some experts say the move has actually spurred more action on climate change. Former United Nations climate negotiator Shyla Raghav, who now works on climate change issues at Conservation International said that under the Obama administration, she said climate change was seen as the government's responsibility. Though she said the Trump administration's decision to withdraw was a step back, it galvanized businesses and other governments to act to "fill the void". While the process of America's withdrawal from the agreement will still take more than a year, European countries – such as France – have pledged to step up their efforts and activists have said they are encouraged by the steps private, large corporations have taken. The Paris Agreement was signed by the U.S. in April 2016 and included 147 countries. The international agreement was non-binding but represented a pledge by those countries to reduce emissions of greenhouse gases that contribute to global warming and limit worldwide temperature increase to 2 degrees Celsius, when many scientists say the effects could become more severe. Trump said the climate agreement was unfair and a bad deal for the U.S. 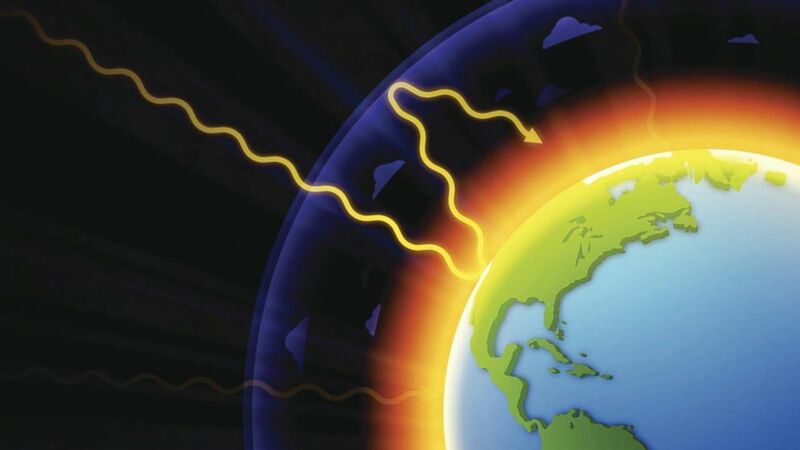 The greenhouse effect occurs when Earth's atmosphere traps heat radiating out into space. Environmental Protection Agency Administrator Scott Pruitt has also defended the decision, saying that the president was right to reject the Paris deal because it was more about politics than action. "The president a year ago this Friday said that he's going to put America first. You know that we weren't as a country going to be apologetic about how we do business with respect to these environmental issues we lead the world in CO2 reduction and we've done it largely through innovation and technology," Pruitt said in an interview with the Washington Free Beacon, a conservative news outlet this week. (Omer Messinger/NurPhoto via Getty Images) Demonstrators hold signs to protest against President Trump's decision to pull out of the Paris Agreement, on June 2, 2017, near the Brandenburg Gate, in Berlin, Germany. 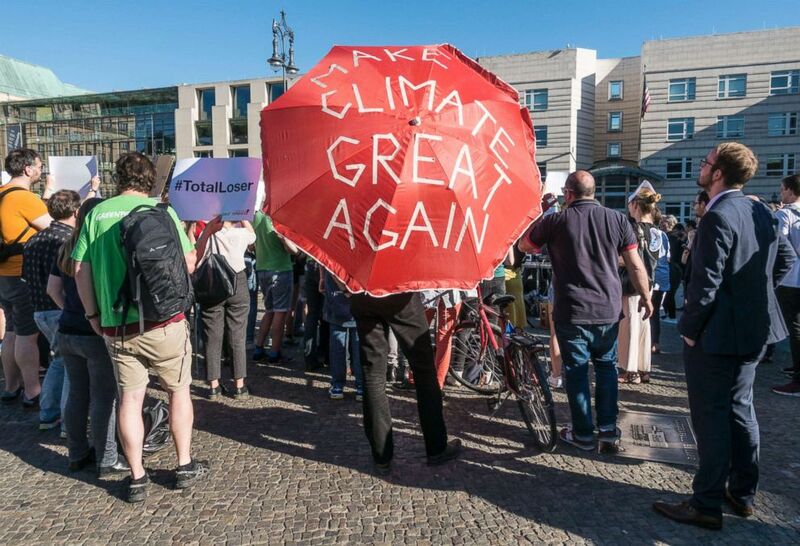 But some supporters of the Paris agreement say that Trump's position on the Paris Agreement actually gave up some U.S. influence on international climate policy. The former chief climate negotiator under the Obama administration and senior fellow at the Brookings Institution Todd Stern said Trump's decision hurt the U.S. diplomatically. Stern said he went to an international climate conference in Bonn, Germany at the end of last year and saw first-hand that other countries in the agreement are disappointed by the U.S. decision. "We're missed and people are angry. They're angry. The United States was a big part of the reason why this agreement came out the way this came out and you had any number of countries that sort of extended themselves a little bit outside of their comfort zone trying to accommodate positions that we were putting forward," Stern said in a Brookings Institution podcast. Other countries in the agreement have continued to pledge support for reducing emissions that lead to global warming. French President Emmanuel Macron even said at the Bonn climate summit that Europe will replace funding the U.S. would have contributed to United Nation efforts on climate. Major businesses like Walmart, McDonalds, and even Apple have said they will change their business strategies to eliminate or reduce greenhouse gas emissions from their supply chains. Local lawmakers within the U.S. have also promised to step up even without the federal government's commitment. Trump said in his announcement that the U.S. plans to withdraw that "I was elected to represent the citizens of Pittsburgh, not Paris." But the mayor of Pittsburgh was one of many local leaders to respond that their cities would keep working to reduce greenhouse gas emissions even if the U.S. is no longer officially part of the global agreement. Cities and states have changed policies to keep with the Paris Agreement's goal to limit global warming by reducing emissions from fossil fuels and rely more on renewable energy. Hawaii was the first state to pass a law last summer saying the state would follow the agreement. Mayors of more than 400 cities around the country, nine states, including Hawaii, and hundreds of business and other groups have also signed on to efforts to mitigate climate change. One of those coalitions called "We Are Still In" even participated in that international climate meeting in Bonn last year separate from the official U.S. delegation, saying they want other countries to know that even if the U.S. isn't officially part of the Paris Agreement cities and states are still invested in reducing greenhouse gas emissions. This fall California will host the Global Climate Action Summit, an international gathering which Raghav said will be the "biggest climate change event of the year". "I get the sense that everyone has tuned in to solutions and actions that they can take rather than just assuming that something else will take care of it," Raghav said. "That means everything ranging from considering climate change in our purchasing decisions, voting choices, and daily lives."